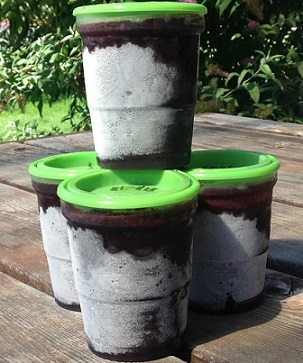 With the bounty of fresh blackberry season, my daughters made some wonderful no-cook freezer blackberry jam after spending an afternoon picking berries. Freezer blackberry jam is easy to make and does not require any cooking over the stove or placing the jam in a water bath for processing. When making freezer blackberry jam or jelly, you get to preserve the delicious taste of summer blackberries without the fuss, heat, equipment, and time that canned jams and jellies require. All you need is ripe blackberries, sugar (or other sweetener), freezer jam-compatible pectin, and about 15 minutes of easy kitchen time. Check out Linda’s Butters, Condiments, Sauces, Relish and Jam Recipes for more great ideas. * Selecting Blackberries - Make sure to choose blackberries that are shiny in appearance, plump, and firm. Refrigerate to prevent deterioration until ready to use. Only wash the blackberries right before you are ready to use. ** Pectin is a natural substance found in fruit that enables fruit juice to set up and form a gel. Pectin is available at grocery stores, especially during the canning season of spring through late summer. 6 (8-ounce) plastic freezer container with lids or (8-ounce) glass jars with lids and bands. Jam can ONLY be made in small batches at a time (about 6 cups at a time). DO NOT increase the recipe or the jam won't "set" (jell or thicken). Preparing the equipment: Before you start preparing your freezer jam, sanitize the freezer containers and lids. Never plunge room temperature jars into rapid boiling water or they may crack. Plastic Containers: Plastic freezer containers can be sanitized in the dishwasher one (1) hour before ready to use. Leave the containers/jars in the dishwasher until right before ready to use. Glass Jars: Glass jars can be sanitized in the dishwasher one (1) hour before ready to use. Leave the jars in the dishwasher until right before ready to use. Place the lids and rings in a medium-size pan and add enough water to equal 1-inch of water. Cover and bring to a boil for 10 minutes. Keep the lids and rings in the hot water until they are ready to be used. Preparing the blackberries: Gently wash, stem, and drain the blackberries (removing any stems, cores, dried-up berries, and leaves). Crush the blackberries with a potato masher, food mill, or use a food processor (If using a food processor, pulse to very fine chop) to lightly crush them. For best results, crush 1 cup at a time. DO NOT PUREE. Sieve all the pulp to remove the seeds. You can keep some seeds in for effect, but I would not recommend for blackberry jam since the seeds are hard on the teeth. 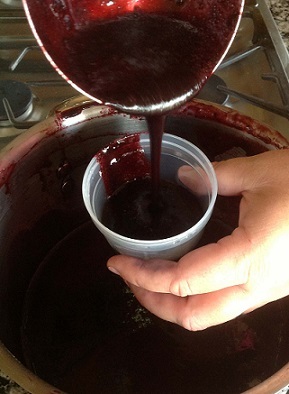 Making the jam: Measure the exact amount of sugar and instant pectin into a large pan or bowl; set aside. NOTE: Reducing sugaror using sugar substitutes other than what’s recommended on the Ball website will result in failure for the jam setting up. The Ball recipe allows for Splenda to be used as a substitute with instant pectin. To use less sugar, you must purchase and use the Pectin for Less Sugar or No Sugar. Add the exact amount (5 cups) of prepared mashed and strained blackberries. Stir until well mixed, approximately 3 minutes. It is important to stir the pectin in well. Place prepared jam into the jars or plastic containers one container at a time. Ladle the prepared jam into the hot, sterilized freezer container. Fill to within 1/2 inch of top of jar (this allows to expansion when freezing). Wipe rim of containers with a clean damp cloth and cover with lids. Let stand for 30 minutes. The Blackberry Jam can be enjoyed immediately! Label container and freeze. Refrigerate any open jars up to 3 weeks or freeze up to 1 year. Yields 6 (8-ounce) half pint containers. Source: Recipe is from the Ball Pectin Calculator website. The instructions on the ingredients lists says to use “5 cups mashed and strained fresh blackberries”, so that means you need to end up with 5 cups mashed and strained. I would recommend to start with a half flat of fresh blackberries and stop once you reach 5 cups mashed and strained. You are right! I corrected the typo. Thank you.